As an adult, I will admit that I am always excited to find an excuse to pull out my Shrinky Dinks and play with them. I love how you can draw something and then make it tiny by simply putting it in the oven. I was inspired, or rather “Pinspired” to make a craft for fall using Shrinky Dinks. 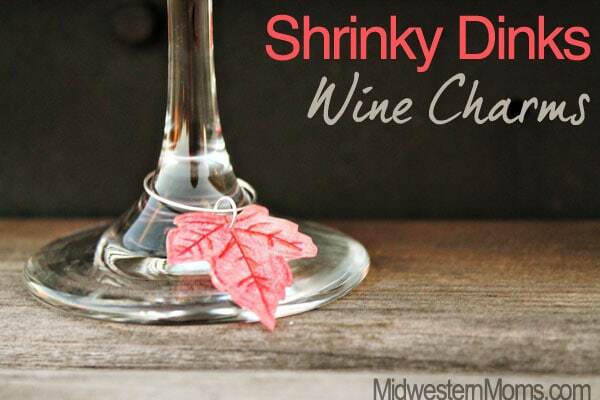 After looking at all of the Shrinky Dinks photos, I knew I had to make something fun for the blog. I love how simple these turned out and think they will be a perfect addition to any autumn party! Step 1: Find a template or design that you want to draw onto your shrinky dinks. I often cheat and find a royalty free image online and print them out to trace. Coloring pages also make great templates. Step 2: Trace the design on the sheet, using the rough side. You can use a permanent pen or colored pencils to trace the design onto the frosted, rough side of the sheet. Step 3: Color in your design with colored pencils. Be sure to color lightly, as you cook the plastic, it will turn darker when it shrinks. Step 4: Cut out your charms. Step 5: Using a small hole punch, punch your hole before you shrink the plastic. I use my Crop-A-Dile Eyelet Setter to punch smaller holes than what a standard hole punch does. Step 6: Place parchment paper into an oven safe baking dish. Step 7: Preheat your oven to 325 degrees. Step 8: Place your shrinky dinks in the oven for 3 minutes. By then, they should have flat edges. If they don’t, leave in just a bit longer and the edges will flatten out. Step 9: Let cool before you touch. Step 10: Using your pliers, open your jump ring, place the charm on the jump ring and close back with your pliers. Step 11: Slide the jump ring onto the wire hoop, wrap around your wine glass and close with pliers.